Not to be confused with Peter M. Donohue. Peter Joseph Donohue (November 5, 1900 in Athens, Texas – February 23, 1988 in Fort Worth, Texas) was a right-handed starting pitcher with a 12-year career from 1921 to 1932. 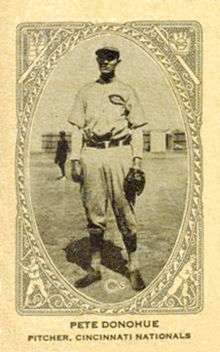 He played for the Cincinnati Reds, New York Giants, both of the National League, and the Cleveland Indians and Boston Red Sox of the American League. His interment was located at Fort Worth's Greenwood Memorial Park along with Tom Baker and Jackie Tavener.